Canada’s luxury housing market is in the midst of a striking transfer of wealth, as baby boomers trade up for bigger houses while pouring huge sums into real estate for their children. 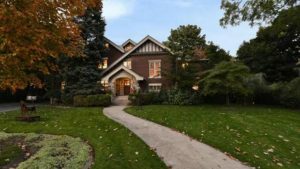 “I don’t think you’ve ever had nearly as much help from one generation to the next in buying homes,” said Ross McCredie, CEO of Sotheby’s International Realty Canada, which issued a new report examining the finances and buying habits of different generations of buyers in the “luxury” market, which generally refers to the higher end of real estate markets across Canada. Among the more surprising generational trends is that far from downsizing to smaller condos as they age, wealthy boomers are increasingly looking to upsize into luxury homes, often because they still have adult children living at home. Empty-nesters are more likely to “right-size” into bungalows and condos that are only slightly smaller than their previous home. In many cases, boomers are taking on debt to buy luxury homes, despite the fact that the typical boomers buying in Canada’s high-end market earn an average of $500,000 and can easily afford to pay cash. Often they’re looking to take advantage of low interest rates to invest their home equity in vacation homes, investment properties or the stock market. More often than not, that money is flowing to their children in the form of large down payments for luxury homes. For many boomers, Mr. McCredie says, the down payment is a form of succession planning, as many see the housing market as a safe and tax-free way to transfer wealth to their kids. Thanks to comparatively lower incomes and fewer savings than other generations, young luxury buyers are “overwhelmingly” relying on outside support for a down payment, the report said. The money isn’t always a gift. In many cases, parents might be paying $200,000 to $300,000 toward a $1-million home for their children, but are doing it in the form of loans and mortgages and are putting liens on the property as to keep their children from squandering their real estate wealth or losing their home in a break-up. That generational wealth transfer is helping to drive a wedge in the first-time home buyers market. Wealthy Generation Y buyers, those under age 35, typically pay twice as much for their homes as the average first-time buyer. They can spend as much as 15 times their household income on a home purchase, thanks to help from mom and dad. That gap is most dramatic in Calgary, where the typical first-time buyer spends $363,400 on a property. Young luxury buyers in the city are willing to spend anywhere from $800,000 to $1.5-million even though their incomes are modest compared to luxury buyers in other Canadian cities: averaging just $50,000 to $100,000. The typical luxury home for a young Calgary buyer is a 2,000-square-foot, four bedroom, three bathroom townhouse or duplex, even though most are young single men or childless couples. Despite a helping hand from family, roughly 85 per cent of young buyers also take out a mortgage. That number was as high as 95 per cent in Toronto, where Gen Y buyers earned an average of $80,000 to $250,000 and bought homes worth $800,000 to $2-million. Largely left out of the generational wealth transfer are buyers from Generation X, age 34 to 54, of whom just 35 per cent received help from family to afford a home, the report said. Many Gen X buyers had parents who had lived through the twin real estate busts of the early 1980s and 1990s, when interest rates soared to double digits. They are much less willing or able to help their kids get into the housing market. Typical home: Condo, minimum 800 sq. ft. Typical home: Condo with min. 900 sq. ft.